When we showed up at Pebble Beach this morning (really, really early this morning), we had a pretty good idea of classics and concepts that we wanted to cover. 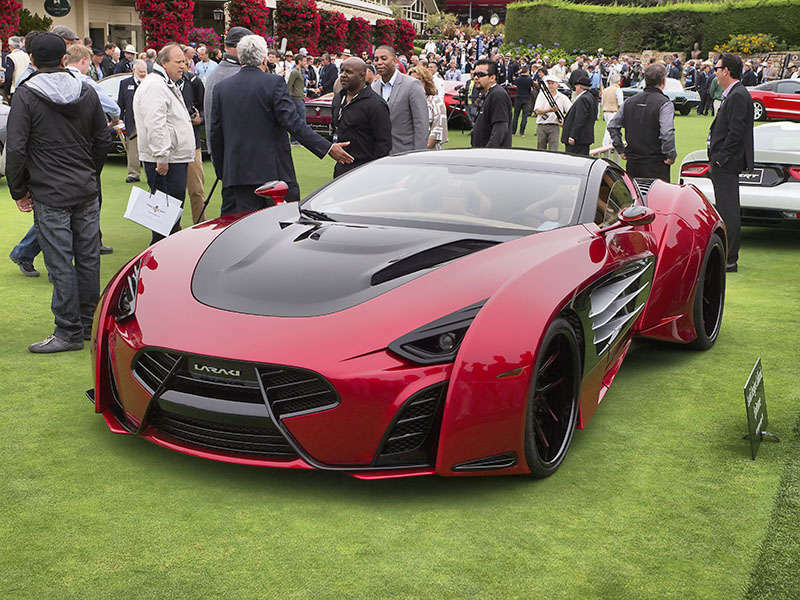 To be completely honest, the Laraki Motors Epitome Concept car wasn't on our cheat sheet. We hadn't heard of the wildly scooped and scalloped show car, and, until our recent chat with the company's head of sales Quinton Q. Dodson, we didn't really know what we were looking at either. Laraki, the eponymous pet project of the yachting industry's Abdesslam Laraki, is a true beast of a thing, built up on the chassis of a C6 Corvette. Those aggressively styled body panels have been crafted entirely of carbon fiber, helping to bring the curb weight of the car down to around 2,800 pounds. Of course the most impressive part of this concept car is the prospective powertrain Laraki is offering its well-heeled customers. The 7.0-liter Chevy V8 has been given all new internals and hooked up to a pair of identical turbochargers. With that rig, the company spokesperson tells us the Epitome is good for 1,200 horsepower on pump gas. But wait, there's more. The Laraki actually has two gas tanks with one chamber meant for Regular and another intending to hold 110 octane. At the touch of a button, the Epitome will change its ECU map, allowing it to burn gas from both tanks, and raising the output to a nearly unbelievable 1,750 hp. How much for all this power and carbon work? Asking price is a cool $2 million. That's a lot of money in the real world, but chump change here at Pebble, right? We'll admit that we're a bit cautious in believing such astonishing claims from a heretofore unheard of boutique builder, but we'd certainly like for the Epitome to become a real thing. Plans only call for building nine examples of the supercar, as of right now, though some of the Laraki folks were hinting broadly that they had future product plans laid out already.